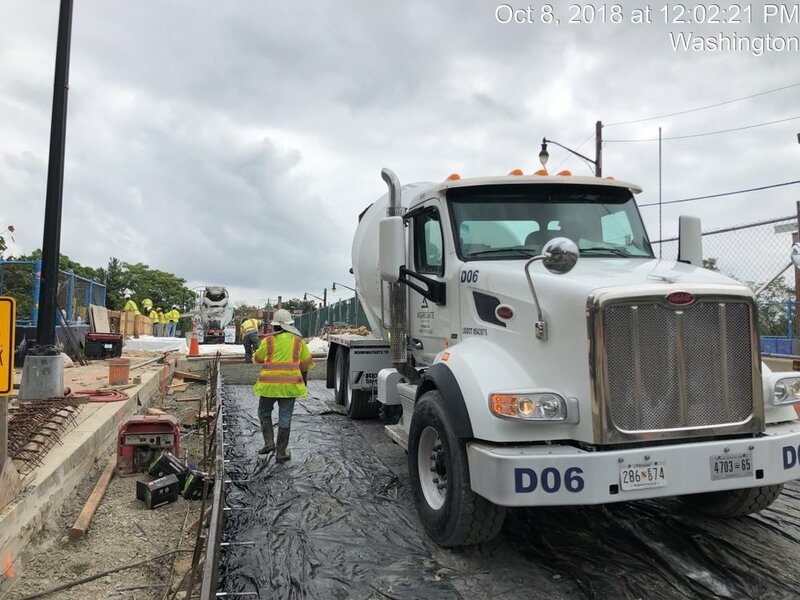 The contractor is currently working on the south side of Monroe Street NE Bridge within the construction zone. 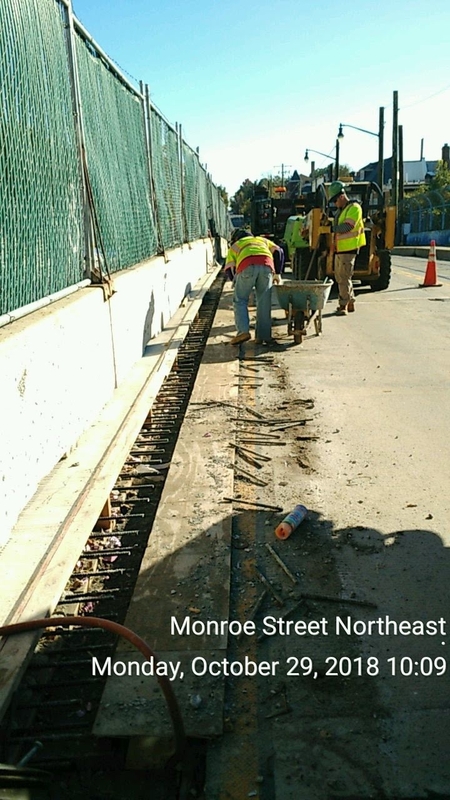 The following was completed during the above period: secured portable precast PCC barrier with anchor bolts to commence Phase 2; completed installation of temporary pavement markings for Phase 2; removed existing overlay from existing deck for phase 2 demolition; replaced the existing sidewalk between 7th Street and 8th Street on Monroe Street (south side); installed scaffolding for temporary access to tracks (CSX Side, West Abutment for Phase 2); backfilled utility trench on 8th Street between Lawrence Street and Monroe Street; and relocated temporary attenuator at 8th Street intersection on Monroe Street. 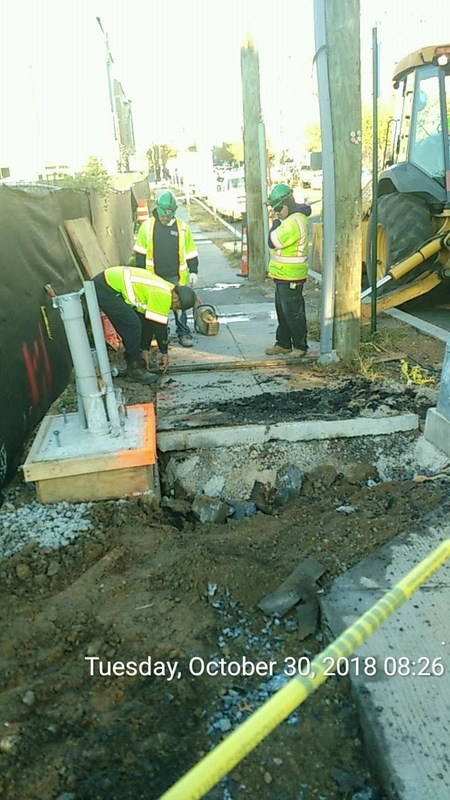 In addition, Verizon was onsite pulling cables at utility manhole at 8th and Monroe Street NE. 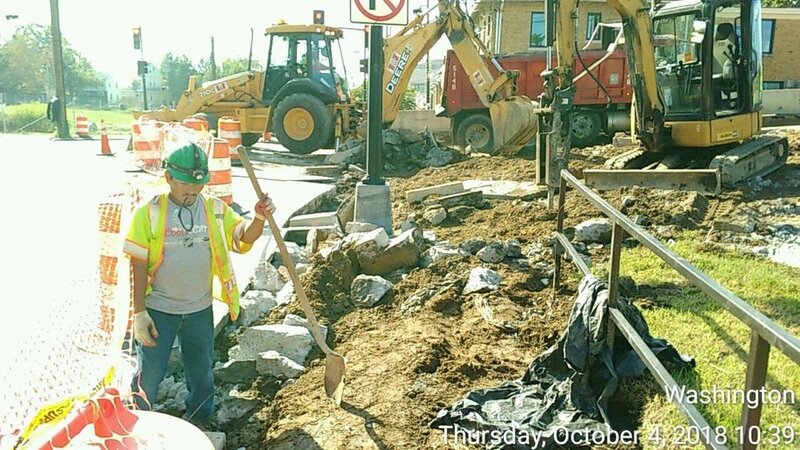 There were no lane closures needed to complete this week’s construction activity. Traffic was maintained with two open-lanes, eastbound and westbound. 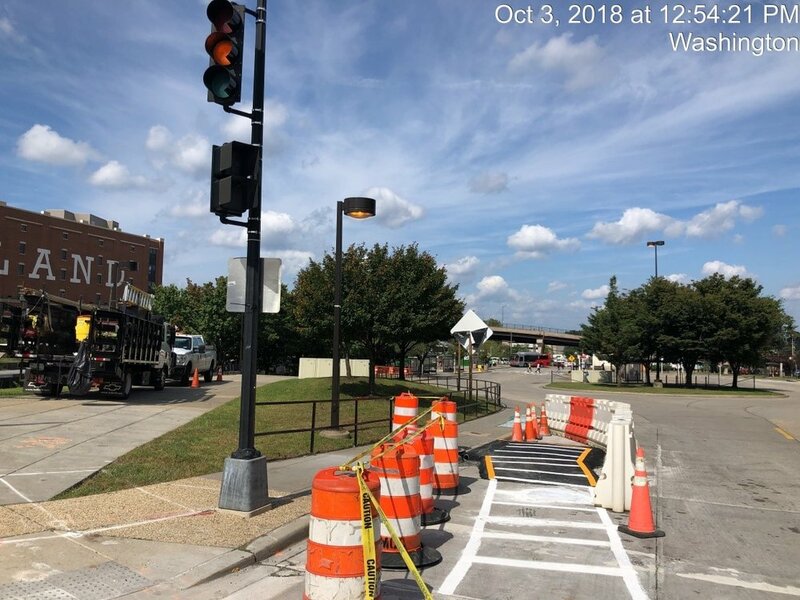 Due to construction, there is no parking on Monroe Street from 7th - 8th Street NE. 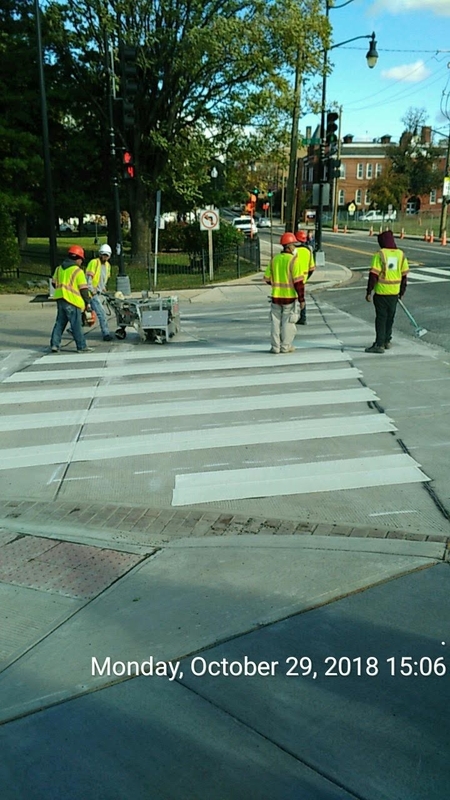 Signs directing motorist and bicyclist have been posted. Please stay alert and obey signage when traveling through this area. 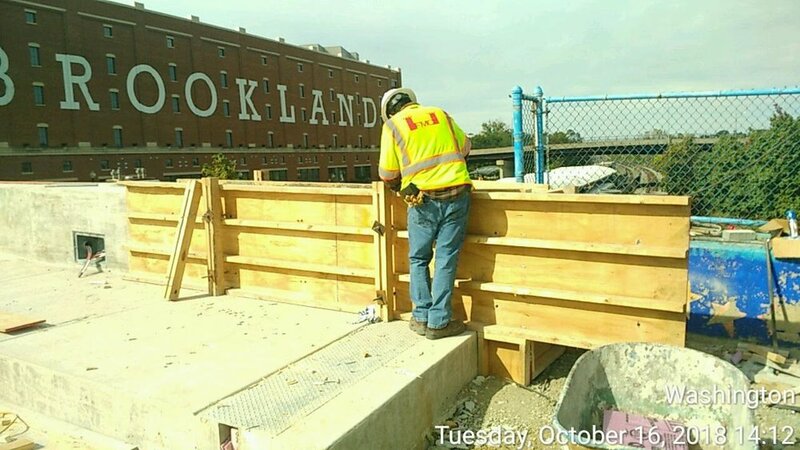 The contractor worked on the north side of Monroe Street NE Bridge within the construction zone: completing form work for the parapet wall and placing the concrete for new wall (Span 1 to 3); installation of temporary fence on the bridge parapet (north side); seting the form and placing PCC base and ADA ramps at Monroe and 9th Street; trench back filling between 9th and 10th Street on Monroe Street, placing the concrete for base repairs; performing the diamond grooving of the new bridge deck and approach slabs; placing the finished concrete pavement PCC base and PCC sidewalk at NW corner of 9th and Monroe Street; installation of the two new light poles at 8th Street and 9th Street; installation of the five new traffic signals and one new pedestrian signal on the new poles at the north side of 8th Street and Monroe Street; placing the asphalt paving tie ins along Monroe Street Bridge (east and west approaches) in preparation for the traffic shift; installation of the two new traffic signals and two new tear drop street light pendants on the new poles at the north side of 8th Street and Monroe Street. 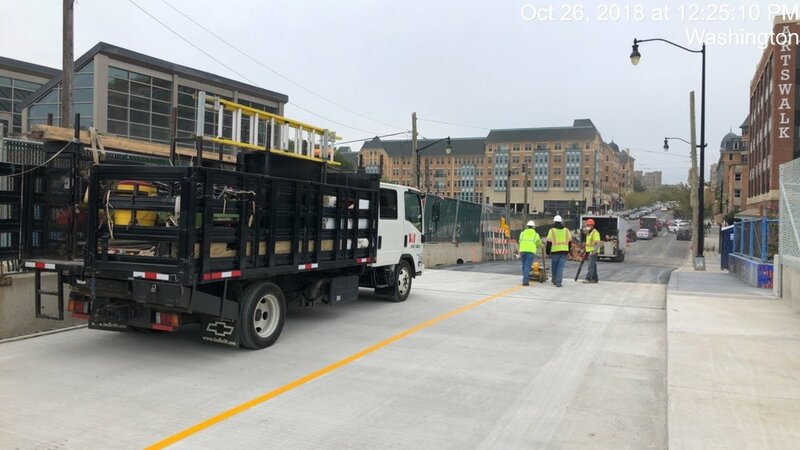 The contractor switched to the south side of the Monroe Street NE Bridge for Phase 2: including the installation of temporary construction warning signs, pavement markings, relocating barriers and switching phase 2 traffic on the newly built north side bridge. 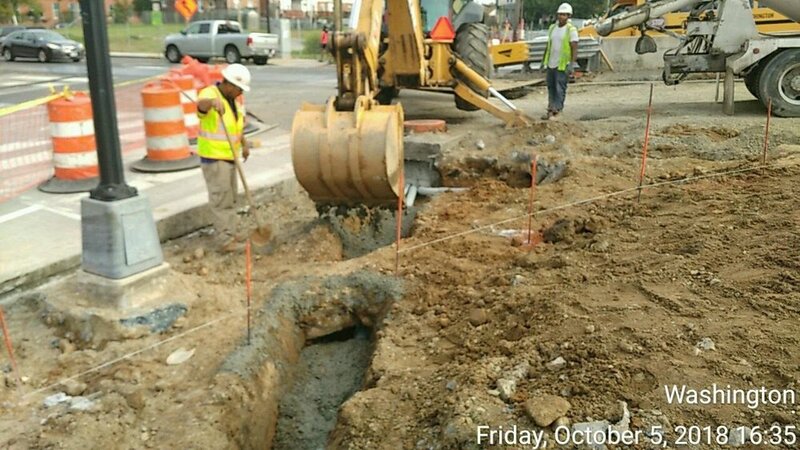 The switch was completed by 3:30 PM on Friday, October 26. 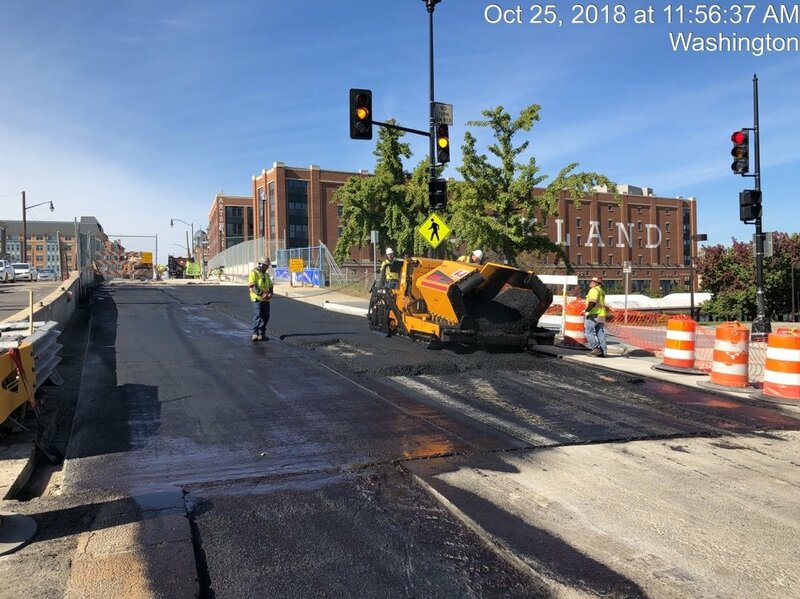 There were no lane closures needed to complete this week’s construction activity. All traffic was maintained with two open-lanes, eastbound and westbound. 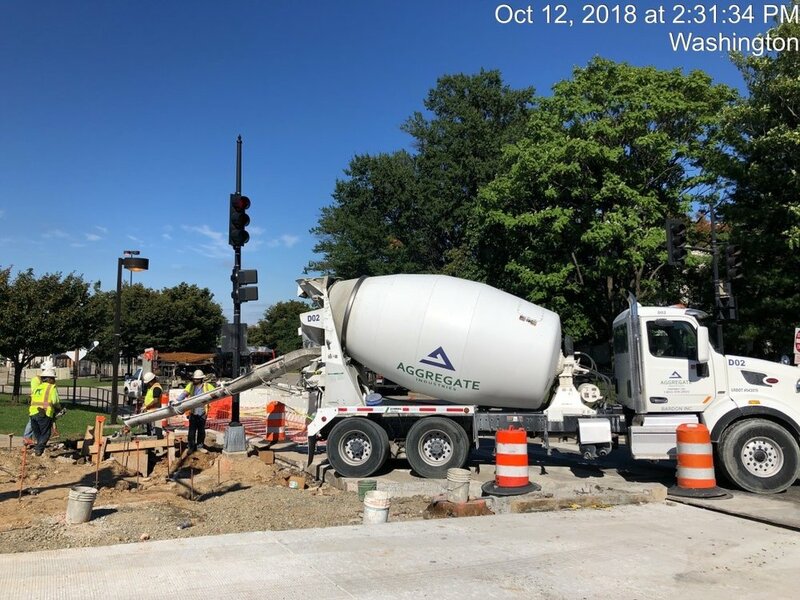 The contractor worked on the north side of Monroe Street NE Bridge within the construction zone: excavated for the proposed conduit between 9th and 10th on Monroe Street NE; continued forming the street light pole foundation at 8th Street (west side); completed form and rebar installation and placed concrete for the parapet tie in to both ends of the approach slabs; continued forming and rebar installation for the traffic signal pole at Monroe Street and 9th Street; continued installation of conduit for street lighting and traffic signals and installed two street light poles on the bridge; placed the concrete for light post and traffic signal foundation at 8th Street and 9th Street intersections; placed concrete for PCC base repairs between 9th and 10th Street on Monroe Street; cleaned construction debris and prepped the new bridge for proposed diamond grooving; placed concrete for sidewalk at 8th Street (west side) near Lawrence Street. 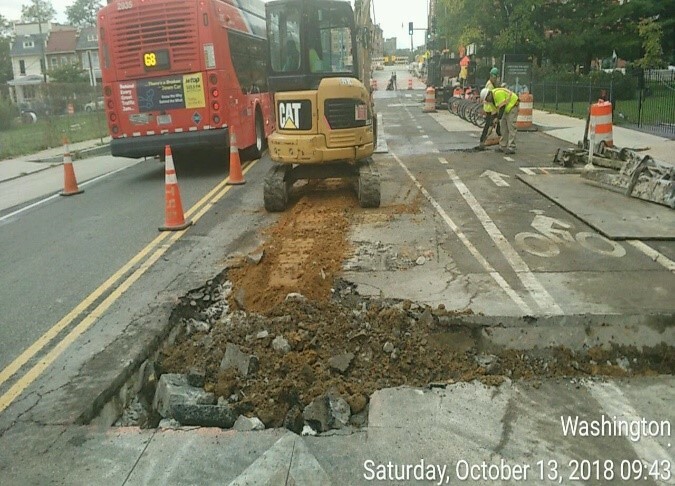 There were no lane closures needed to complete this week’s construction activity. All traffic was maintained with two open-lanes, eastbound and westbound. 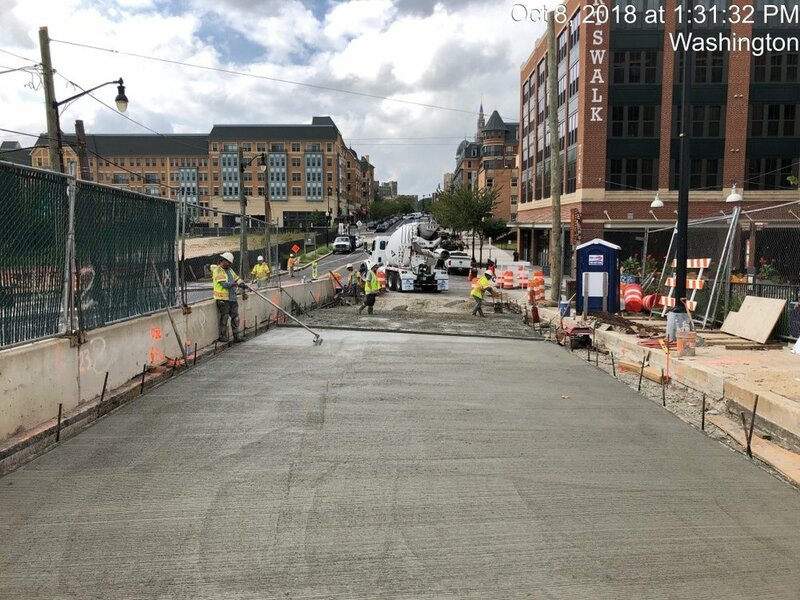 The contractor worked on the north side of Monroe Street NE Bridge within the construction zone: continued form work for the proposed parapet wall and placed concrete for new wall (span 1 to 3); completed excavation, fine grading and placement of temporary asphalt for sidewalk at 8th Street (west side); set form and placed PCC base on the east side of the bridge at Monroe Street and 9th Street; continued wet curing for the previously placed parapet concrete on deck (span 1 to 3); continued installing conduit for proposed street lighting and traffic signals; completed excavation, form and rebar installation and concrete placement for light post and traffic signal foundation at 8th & 9th Street intersection; completed excavation for proposed conduit between 9th and 10th Street on Monroe Street; cleaned construction debris and prepped the new bridge for proposed diamond grooving; placed concrete for the sidewalk at 8th Street near Lawrence Street (west side); completed excavation for the proposed conduit and form work for the light post between 9th and 10th Street on Monroe Street. 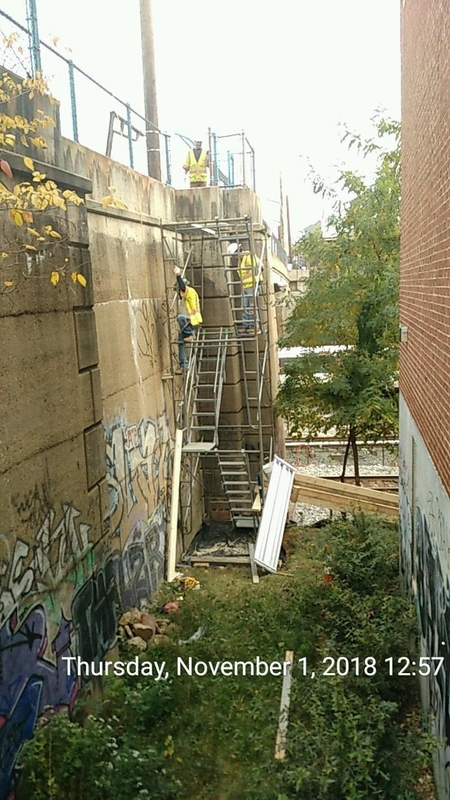 In addition, Comcast was on site completing removal of overhead equipment from the bridge. 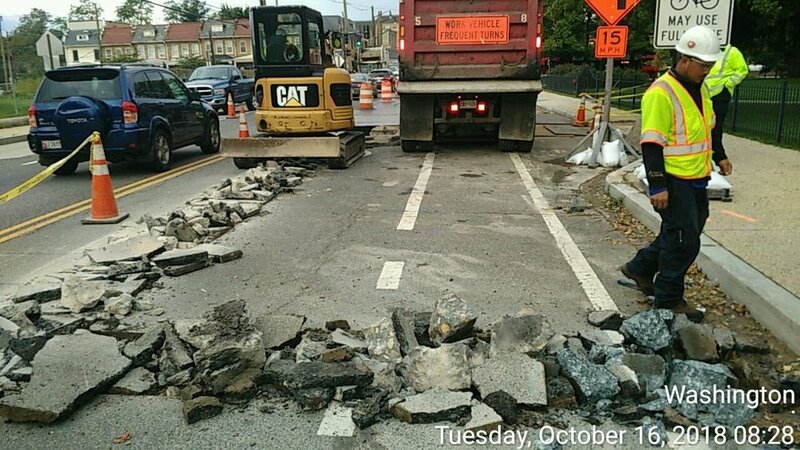 There were no lane closures needed to complete this week’s construction activity. All traffic was maintained with two open-lanes, eastbound and westbound. 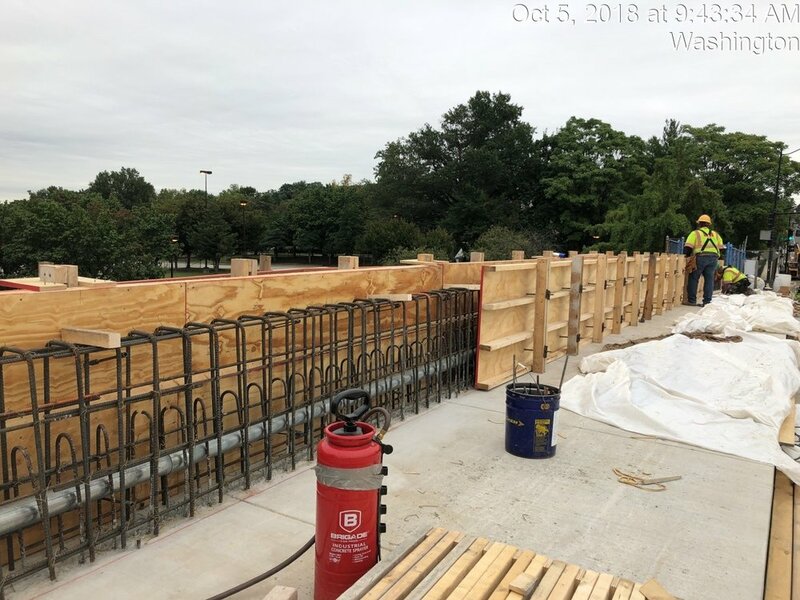 The contractor worked on the north side of Monroe Street NE Bridge within the construction zone: continued wet curing for the previously placed concrete on deck and approach slabs; continued excavation for full depth pavement at Monroe and 8th Street; electricians continued installing the conduit on the bridge for proposed street lighting; started installing the form work and rebar for the proposed parapet wall (north side); started subbase installation for the PCC base at 8th Street and 9th Street intersections; demolished the existing sidewalk & pedestrian ramps at the NW corner of 9th and Monroe Street; excavated & installed conduits for street lighting & traffic signals at 9th Street (NW corner). 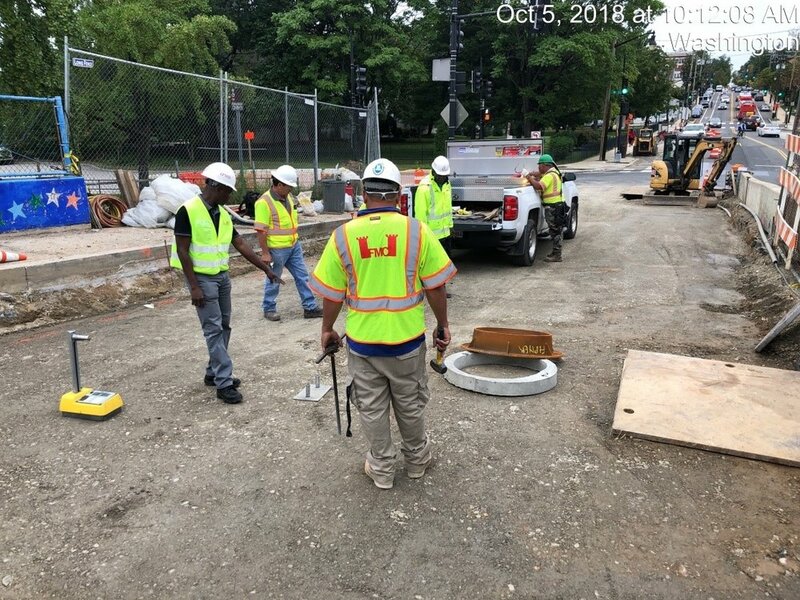 In addition, Comcast and DC Net were on site tying and switching cables over at 8th Street and 9th Street. 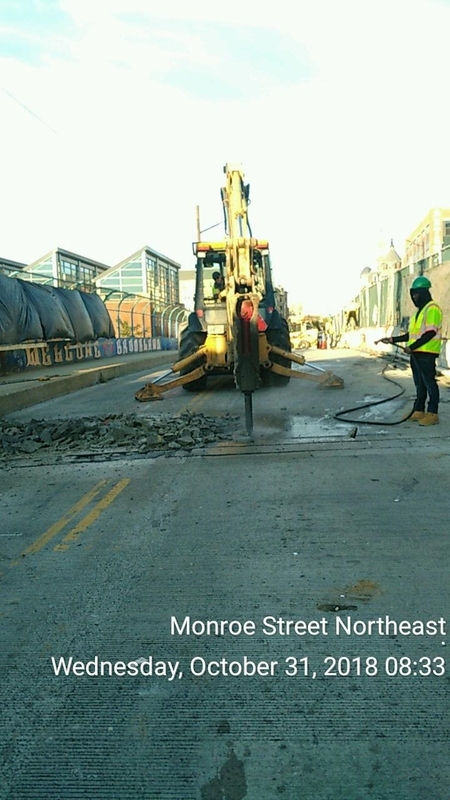 There were no lane closures needed to complete this week’s construction activity. All traffic was maintained with two open-lanes, eastbound and westbound.